Be the first to share your favorite memory, photo or story of Norma . This memorial page is dedicated for family, friends and future generations to celebrate the life of their loved one. 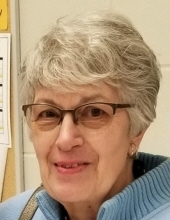 Norma D. Henningsen, age 79, of Council Bluffs, passed away April 5, 2019 at Jennie Edmundson Hospital. Norma was born October 21, 1939 in Casey, Iowa to the late Rolle and F. Gertrude (Tomlinson) Dafford. She graduated from Atlantic, Iowa High School in 1958. Norma married Lyle D. Henningsen on June 13, 1959. They were blessed with three sons, Michael, Carl and Kevin. Norma worked at Walnut Grove and Atlantic High School before moving to Council Bluffs. In Council Bluffs, Norma worked at Iowa Finance/Avco for 10 years and First Federal Savings & Loan that merged into US Bank, retiring after 20 years. In addition to her parents, Norma was preceded in death by her husband, Lyle Henningsen in 2003; brothers, Robert and Rex Dafford and special friend, Ron Hiatt. Norma is survived by her sons, Michael (Teresa) Henningsen of Council Bluffs, Carl (Tammy) Henningsen of Papillion, Nebraska, Kevin Henningsen of Clarinda, Iowa; 9 grandchildren, 5 great-grandchildren; sisters, Cynthia (Denny) Nehring of Atlantic, Iowa, Beverly Knudtson of Tallapoosa, Georgia; nieces and nephews. To send flowers or a remembrance gift to the family of Norma D. Henningsen, please visit our Tribute Store. A lunch will follow at the Walnut Hill Reception Center, 1350 E. Pierce St. Interment, Saturday, 2:30 p.m. in Monroe Methodist Cemetery, Walnut, Iowa. "Email Address" would like to share the life celebration of Norma D. Henningsen. Click on the "link" to go to share a favorite memory or leave a condolence message for the family.